The Alpine Dachsbracke is a short-legged, sturdy hunting dog with a robust, strong boned body structure, dense coat and firm muscles. It has a straight bridge of nose with a definite stop and a lightly arched skull. Strong muzzle with pronounced transition to cranial region. Well defined furrow in forehead, lightly emphasized occiput. The nose is black and the lips are close fitting with black pigment, moderately rounded curve of lips. Strong complete teeth with scissor or pincer bite. The eyes have dark brown irises and the eyelids are close fitting to eyeballs with black pigment. The neck is muscular and not too long. The trunk is strong and well-muscled, elongated. Withers moderately emphasized; straight back; loins short and broad. The rump is barely sloping. The chest is deep and broad with pronounced forechest. Depth of chest should be about half the height at shoulder. The belly is moderately tucked up. The tail is set on high, thick at root. Longer hair on underside (brush tail); reaching barely to ground, carried slightly downward. The limbs are close fitting. Shoulders are long, sloping and strongly muscled. Front legs are straight and strong; they appear short in relation to the body. Hindquarters are muscular, strong and well angulated. Seen from the rear, the axis of the legs is straight. The front and hind feet are strong, round, toes tight against each other with strong pads and black nails. The Alpine Dachsbracke has a double coat consisting of very thick top coat and a dense undercoat, which covers the whole body and is close fitting. The ideal color is dark deer red with or without black hairs lightly interspersed. Also black with clearly defined red-brown markings on head (Vieraeugl), chest, legs, feet and underside of tail. A white star on chest permitted. Intelligent and friendly with a fearless personality. A robust, weather resistant working dog used by the mountain huntsman, the Alpine Dachsbracke is used as a tracking hound for wounded deer and as scenthound for hare and fox. Be sure to remain the dog's firm, confident, consistent pack leader to avoid unwanted behavior issues. 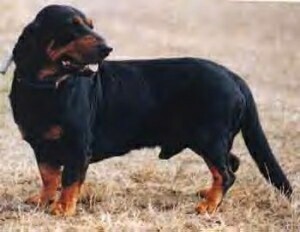 Alpine Dachsbrackes were bred to hunt and have great vitality and stamina. They need plenty of exercise, which includes long daily walks. They will be in their glory if they are taken on hunting trips. The smooth short-haired coat of the Alpine Dachsbracke is easy to look after. Brush with a firm bristle brush, and bathe with mild soap only when necessary. Dry shampoo occasionally. Be sure to check the ears carefully for signs of infection and keep the nails trimmed. Already in ancient times, a hunting/shooting dog was used which bore a remarkable resemblance in appearance to the Alpine Dachsbracke. Crown Prince Rudolf of Habsburg in 1881 and 1885 made his gamekeepers from Murzsteg and Ischl include Alpine Dachsbracken on his hunting trips to Turkey and to Egypt. In 1932 the Alpine- Erzgebirgs - Dachsbracke was recognized by the top canine organizations in Austria as the third scenthound breed. In 1975 the name was altered to Alpenlaendische Dachsbracke and the FCI declared Austria as the country of origin. In 1991 the Alpenlaendische Dachsbracke was included in Section 2 of Scenthounds in the FCI nomenclature.